The US Africa Command releases video footage of its air strikes against IS in Sirte (Photo: US Africa Command). The United States Africa Command has released video footage of one of its Operation Odyssey Lightning air strikes against IS targets on 4 August in Sirte. 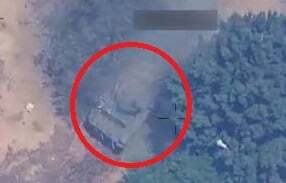 The 25 second footage purports to show its first air strike on an IS T-72 tank, which the Africa Commands says it ”successfully disabled”. The footage shows a tank hiding between trees. 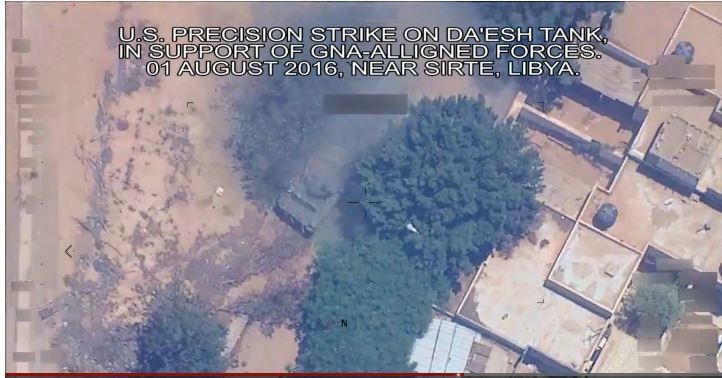 The video footage shows an air strikes against an IS tank in Sirte hiding between trees (Photo: US Africa Command). Further strikes on a resupply truck and a logistics truck were also carried out, the report says. The Africa Command said that ‘‘At the request of, and in coordination with, the Libyan Government of National Accord, U.S. Africa Command conducted precision air strikes against Daesh targets in Sirte, Libya’’. ‘‘These airstrikes bring the total number of airstrikes in support of Operation Odyssey Lightning, which began Aug. 1, to 11. The U.S. stands with the international community in supporting the GNA as it strives to restore stability and security to Libya”. ”These actions, and those we have taken previously, will help deny Daesh a safe haven in Libya from which it could attack the United States and our allies”, the report said. The air strikes come in support of the Faiez Serraj-led Presidency Council/Government of National Accord, which is the only internationally recognized Libyan government of Libya. It is backed by UN Security Council Resolution 2259. The PC/GNA were formed by virtue of the UN-brokered Libyan Political Agreement signed in December 2015. the LPA, however, recognizes the Tobruk-based House of Representatives (HoR) as the sole legislature. The HoR has yet to vote and approve the GNA and therefore considers its actions illegitimate. The HoR president Ageela Salah, who is on a boycott list by the international community, has not supported the request by Serraj for the US to carry out the airstrikes against IS in Sirte. After making fast progress in July, the GNA-allied Libyan ground operation against IS in Sirte, led overwhelmingly by Misratan forces under the name Bunyan Marsous Operation Room, has failed to eradicate IS. The operation was able to move swiftly initially as the battle was carried out in more open ground, however as IS started using more IEDs and the battle moved to more urban areas, the Bunyan Marsous forces have been bogged down.